Kris was raised on a farm, learning at a young age the definition of hard work and perseverance. After graduating with an undergrad degree in Electronic Engineering Technology, she began her career as an engineer and technical writer. Currently she is a Senior Advisor for IT Business Consulting at Dell Technologies. Yes, she is a rising female talent in the STEM industry, but there’s so much more to Kris. Soon after the birth of her daughter, Kayla, she realized her baby girl was different. At age 3, Kayla was diagnosed with mitochondrial disease after many tests and emotional trips to the emergency room. Later Kayla’s diagnosis was coupled with Trio, a diagnoses which she shares with only 20 other people worldwide. When some would slow their pace in life to accommodate a child with special needs, Kris kept running forward. In fact, running long distances! She shared her love of running and competition with Kayla, pushing her in many training runs and competitions. Kayla enthusiastically cheered her mom on in their big race, the 2013 Boston Marathon, a race no one will forget. 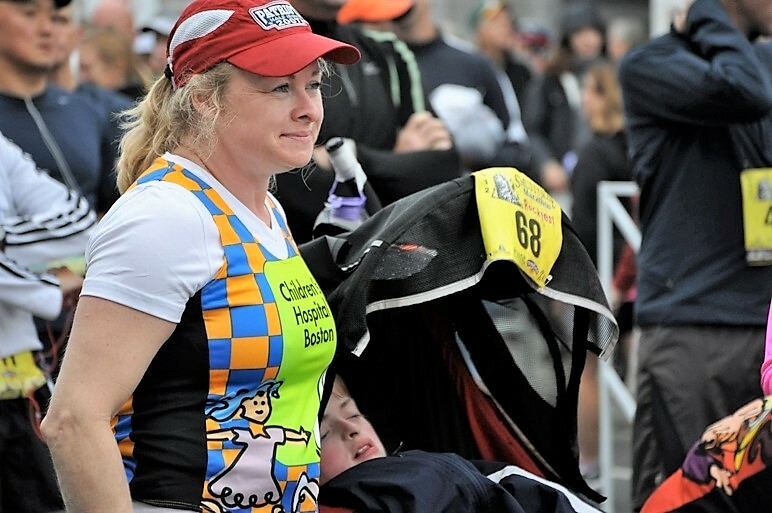 As a focus for healing after losing her husband and Kayla’s father, at a (too) early age of 42, Kris and Kayla became the first mother/daughter team ever to run and finish the Boston Marathon. Kayla was all smiles as they approached the finish line, but moments before they crossed, the first bomb went off, pushing them sideways. In the chaos, mother and daughter were able to quickly cross the finish line as they headed for protection from the attack. Kayla’s smile never faltered though, she thought the bombs were fireworks celebrating their big finish, an optimistic attitude she definitely inherited from her mom. Today Kris continues to inspire as she shares her life with husband, Brian, who has a son of his own on the Autism Spectrum. Managing a life with two kids with special needs and a successful career in technology, Kris runs her life like one big balancing act. Her days usually begin at 4:30am and are jammed packed with Kayla’s care, her work and the needs of her family and home. Working for Dell, Kris appreciates the balance she is able to achieve in her personal and professional life. Personally, she found an employer with a flexible work culture that enables her to work when and where best fits the needs of Kayla and the family. Professionally, she is able to develop her career and potential to make an impact on the world. And an impact she is definitely making. For the past 5 years, Kris has served as chapter lead of the True Ability Employee Resource Group (ERG) at Dell Technologies, an affinity group that educates and advocates for the needs of the differently–abled. Working together they support team members and families of individuals who are differently-abled looking for improvements in areas such as accessibility, accommodations, benefits, caregiving, self-id, mentoring, hiring practices and neurodiversity. Recently Kris assumed the role of North America co-lead of the True Ability ERG helping Dell Technologies support all talent. And she doesn’t stop there, Kris further advocates through organizations such as Work without Limits, HMEA and various races to raise money for awareness and support. Dell recognizes the value of how employers can step back and evaluate their support for the differently-abled. Whether they are parents to a special needs child or faced with their own physical or mental challenges, everyone has unique strengths and skills to contribute. As an employer, you would not want to miss out on a team member like Kris, who brings determination, commitment and innovation to her company every day. According to Kris, here are the top 6 ways employers can make their companies more attractive to individuals with disabilities in their life. Communicate: External and internal communication of company policies and practices – This will encourage those talented candidates to apply!!! To learn more about Dell Technologies’ commitment to diversity and inclusion, visit https://jobs.dell.com/diversity-and-inclusion.